Will house prices keep dropping? Home » Personal Finance » Investment » Will house prices keep dropping? I don't think much of the "buy low, sell high" model for house purchases. I think a house should be purchased as a place to live, in which case the main questions are whether you want to live there and whether you can afford it, not whether prices have hit bottom. Still, it's a question of interest to a lot of people, so I've been meaning to write an article on the topic. Happily, Vladimir Klyuev, an economist with the International Monetary Fund, has written it, so I don't have to. There are a lot of ways to look at what the "right" level is for house prices. In the IMF Working Paper What Goes Up Must Come Down? House Price Dynamics in the United States, Klyuev looks at two of them: the supply and demand fundamentals, and an asset-market perspective. The red line is the real (i.e. inflation-adjusted) cost of rent. The blue line is the real home price. 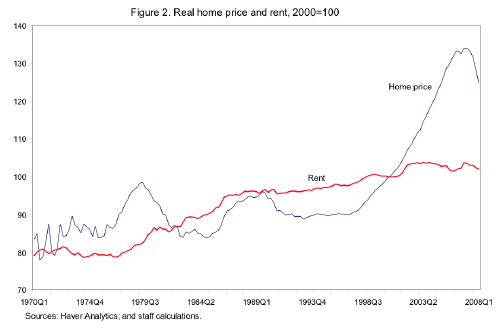 If we can expect the costs of houses and of rent to return to roughly the same relationship that they had between 1970 and 2000--and I think we can--then it looks to me like house prices still have a long way to fall. I think in some areas home prices are still going to go down. Like Phoenix and Vegas but a lot places the home prices ares staying about the same. I invest in real estate and I have been fortunate the values of my rental homes have not dropped and I don't expect them to drop much. Take out those 2 hard hit states, I'm sure those two lines are very close. Fortunately, most of the prices that are dropping are those in the areas that were already the most inflated. There are two ways that average house prices and rents could come back together. Sure, everyone seems to think it's a free-fall of housing prices; however, with general inflation on the rise it's also very possible that much of the lost ground will be made up by a rise in rents, which have been stagnant for far too long. The paper does go into regional differences, some. It suggests that the gap in the Midwest is pretty small, but that the Northeast, South, and West are all still 20% or more overvalued. One other topic that the paper deals with is the possibility that falling house prices will overshoot to the downside. That's entirely possible, especially if credit markets become even more seized up. We could get into a scenario where nobody can buy, except those who can pay cash. If that happens, I could see prices getting as much undervalued as they were overvalued--which is exactly the situation where buying a house because you want to live in it becomes a superb investment strategy. Prices have room to fall further when measured by rent. This is especially true in areas that have seen rampant price inflation in housing over the last few years. It is also typical after times of irrational exuberance we not only revert to the norm, but overshoot it to the downside for awhile. A good way to measure whether home prices are out-of-whack is to use the GMR number (GROSS MONTHLY RENT). Normally the number investors use is a multiple of about 120 times the monthly rent. So, if a house could rent for $1000 per month, the house would be worth $120,000. All markets move in cycles, this is natural. However, government intervention distorted this last real estate cycle, contributed mightily in making a bubble and delayed the day of reckoning. I expect the downturn to be worse and more prolonged than it might have been. I rent. Sold property early in the bubble (way too early as it turns out) and I'd really like to get a home for my family and myself. So, I view this as an opportunity. In two or three more years. I am in Austin, TX, and fortunately home prices have seemed to stay pretty stable. And in some cases are going up. I think it is because we have such a demand here and so many people are moving here. I'm looking forward to buying a home soon and it doesn't matter to me whether the prices will come down, since I don't plan to move or refinance anytime soon. That said, if they come down before I buy, great! If they don't, well, those are the breaks. I think that's the only sensible way to buy a house. - I believe there is a natural limit on both house prices and rent. - The income of a married couple, with good credit, will limit the rent/house prices in a given area. The area being defined by the driving distances to/from work. - The sub-prime mess was an attempt by the banks and other creditors to get around this limit in order to push up real estate prices. Bankers/Creditors willingly chose to redefine the term "good credit" and hide the risk. - I don't foresee marriages with more than 2 partners. IMHO, multiple families in one house is a niche, also. - Rest assured, the bankers/creditors will try to find other ways to get around this limit, and probably make more messes like the sub-prime one. Furthermore, they will provide MOC campaign contributions to limit their responsibility for the consequences, again. I wonder, and am interested to see, what the effect of the government input of $$ into the housing market will look like in how it effects the house prices. During the housing boom, people were buying and flipping like crazy. Then it busted. The house across from me was bought and sold 3 times in 3 years. big profit but the last buyer got stuck with it and no one has live in it for over 7 years.